Everything was done so elegantly. The staff was very professional and quick to answer any questions that I had. The food was excellent and my guest had a great time. 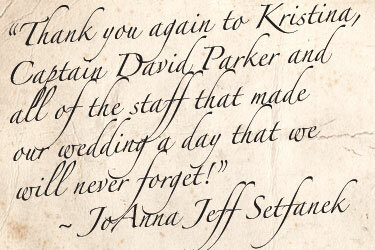 The staff was very accommodating and was willing to make any changes that I wanted/needed. Christina was such a great wedding coordinator. She made me feel so comfortable and did her best to make everything flow smoothly. I couldn’t have asked for a better group of people to share my special day with other than the staff of the Titanic, especially Christina. Christina called a couple of days after the wedding to make sure they had fulfilled my needs and to see how I was doing They even asked me to come back and visit! I don’t feel like I gained a staff I feel like I have gained a family. I hope to always remain close with the wonderful crew aboard the Titanic! I would give this venue 5 stars. My husband and I would like to say thank you to you as well as your other staff and crew member for hosting the wedding ceremony of our dreams! We had a lovely, stress-free time, and everyone who was involved gave us excellent service! We absolutely loved touring the museum, and it was a nice touch how a bunch of the crew members offered personal congratulations to us as we passed through each exhibit! I would also like to thank you for our card and gift box of chocolate; that was too sweet of you and we will cherish the card for ever! We can’t wait to see our photos and be able to share our joy with our family and friends! Keep up the good work!